Hibs v Celtic: Neil Lennon’s return | Goalkeeper out | Formation change? Hibs host Celtic in the William Hill Scottish Cup quarter-finals on Saturday evening, with former Easter Road head coach Neil Lennon returning to his former employers for the first time since his departure at the end of January. Celtic need a win to keep their dreams of a third consecutive treble alive while Hibs, who lifted the trophy under Alan Stubbs in 2016, would relish another trip to Hampden for the semi-final. Both sides have several injuries to contend with - indeed, a reasonable Scottish Premiership XI could be made from the missing personnel - but the two squads available are more than capable of serving up a feisty encounter. Lennon’s return adds an extra dimension to a fixture that Hibs haven’t lost since 2013, but Celtic’s domestic form in 2019 should serve as a warning to the Capital club. In eight games the Hoops have scored 28 and conceded just two. Adam Bogdan remains sidelined after suffering a concussion in the Scottish Cup clash against Elgin in the third round of the cup, so Kevin Dabrowski will assume back-up goalkeeper duties with Ofir Marciano set to keep his spot in goal. Winger Thomas Agyepong is back in training, but long-term casualties Martin Boyle and Ryan Porteous, along with midfielder Ryan Gauld and utility man Steven Whittaker remain sidelined. Celtic defender Filip Benkovic is back in training but won’t be fit for the trip to Edinburgh while Dedryck Boyata has recovered from a knock and should be fit for the tie. Hibs: Thomas Agyepong (recovery), Adam Bogdan (concussion), Martin Boyle (knee), Ryan Gauld (hamstring), Ryan Porteous (knee), Steven Whittaker (groin). Celtic: Daniel Arzani (knee), Filip Benkovic (recovery), Ryan Christie (hamstring), Marvin Commper (groin), Leigh Griffiths (personal reasons), Eboue Kouassi (knee), Callum McGregor (calf), Olivier Ntcham (hamstring), Anthony Ralston (ankle), Tom Rogic (knee). Hibs: Marciano; Gray, McGregor, Hanlon, Stevenson; Milligan; Slivka, Mallan; Horgan; Kamberi, McNulty. Subs from: Dabrowski, Johnson, Nelom, Mackie, Bartley, F Murray, Bigirimana, Omeonga, Shaw, Allan. Celtic: Bain; Toljan, Boyata, Ajer, Tierney; Brown, Bitton; Forrest, Burke, Sinclair; Edouard. Subs from: Gordon, Lustig, Izaguirre, Simunovic, Hayes, Johnston, Henderson, Weah. Marc McNulty has hit six goals since his arrival on loan from Reading. 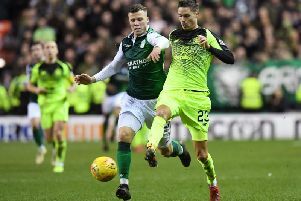 Scott Brown versus just about anyone in the Hibs midfield, although Mark Milligan is likely to match up with the Celtic captain which, given their interaction in last month’s league match, should be particularly tasty. The pace of Oliver Burke and James Forrest could cause the Hibs defence some issues while Odsonne Edouard showed why Celtic shelled out £9 million for his services last summer by netting the winner against Hearts in mid-week. Celtic haven’t won at Easter Road since 2013, when a Neil Lennon-managed side comprehensively defeated Hibs 4-0. There hasn’t been a goalless draw between the two sides since October 2011, and the last at Easter Road was in May 2009. There have been just six draws between the teams in the last ten years. The last time the two sides met on Scottish Cup duty was in the final in 2013. Willie Collum has been handed the whistle for this cup tie, and will be assisted by Frank Connor and David McGeachie. Don Robertson is on fourth-official duties.